An unaltered photocopy of your WD AGO 53-55 OR other military issued document clearly displaying your wartime China service. Please complete and MAIL the APPLICATION FORM. Don't forget to include an unaltered COPY of your WD AGO 53-55 or other pre-arranged document(s). 1. Description: The medal is 1 1/4 inch in diameter with an oxidized, relieved finish. Obverse: On the obverse is the Imperial Chinese five-toed dragon with the inscription CHINA RELIEF EXPEDITION around the upper border and the dates 1900 - 1901 at the bottom. Reverse: On the reverse is a trophy composed of an eagle perched on a cannon supported by crossed flags, rifles, an Indian shield, spear and quiver of arrows, a Cuban machete, and a Sulu kris. Below the trophy are the words FOR SERVICE. Around the border at the top are the words UNITED STATES ARMY and around the bottom are thirteen stars. Ribbon: The ribbon is 1 3/8 inches in width and is composed of the following vertical stripes: 1/16 inch ultramarine blue, 1 1/4 inch golden yellow, and 1/16 inch ultramarine blue. 2. 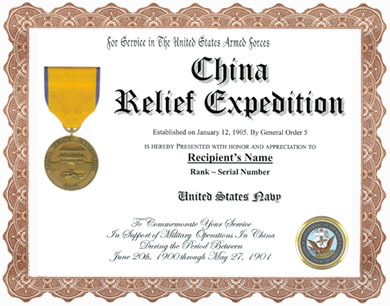 Criteria: The medal is awarded for service ashore in China with the Peking Relief Expedition between June 20, 1900 and May 27, 1901. 3. Components: a. Medal. MIL-DTL-3943/189. c. Streamers. 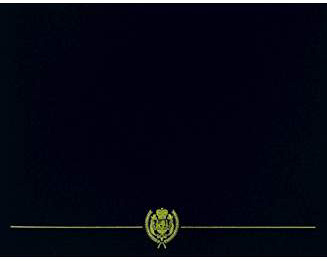 Army units which received credit for campaign participation may display the streamer on the organizational flag. The inscription will be as indicated on the unit's lineage and honors. 4. Background: a. The China Campaign Medal was established by General Order 5 dated January 12, 1905.
b. The dragon, the Imperial emblem when China was an empire, is symbolic of that country. The color yellow was restricted for use only by the Manchu rulers of China during the Ts'ing dynasty (1644-1911). The color blue is emblematic of the east and of the dragon. The eagle standing on the group of trophies signifies the United States Army.